Own a piece of functional art with this beautiful “travel wheel”. 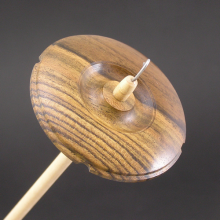 Made by master woodturner, Jim Echter, the True Creations Portable Kick Spindle weighs less than 6 pounds and fits inside a suitcase. Perfect for the spinner on the go. 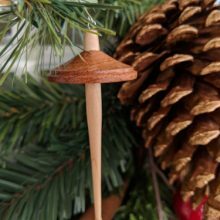 Made from north american cherry with rock maple spindles. Sold unfinished with directions on how to easily use a sealer, such as tung oil, to bring out the warmth that cherry is famous for achieving. 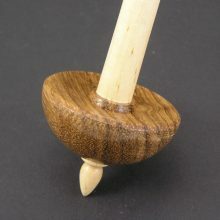 You can learn more, see customer pictures, and watch videos on this kick spindle at the general True Creations Woodturning web site: www.tcturning.com. Each kick spindle is made to order. Average lead time is a minimum of 4-6 weeks. The ultimate “travel wheel”. 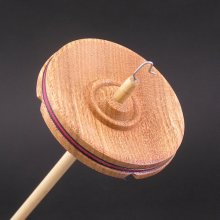 The True Creations Portable Kick Spindle weighs less than 6 pounds and fits inside a suitcase. 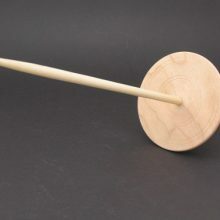 Be the first to review “Portable Kick Spindle” Click here to cancel reply.